Place beans and garlic in a food processor. Pulse a few times to coarsely chop. Turn on food processor to puree beans while slowly pouring in tahini paste. Slowly add olive oil, lemon juice and soy sauce while still processing. Stop the food processor and add salt, cumin, cayenne pepper, and Italian parsley. Pulse a few times to combine. Scrape down sides of bowl and add water, up to 1/4 cup. Process for an additional 10-20 seconds. Remove from bowl and refrigerate until ready to serve. For tomato checca topping, gently combine tomatoes, 1 tablespoon minced garlic, basil, 2 teaspoons salt and 1/3 cup olive oil in a medium bowl. Refrigerate until ready to serve. To serve, spoon hummus into a large bowl or platter. Cover with tomato checca topping. 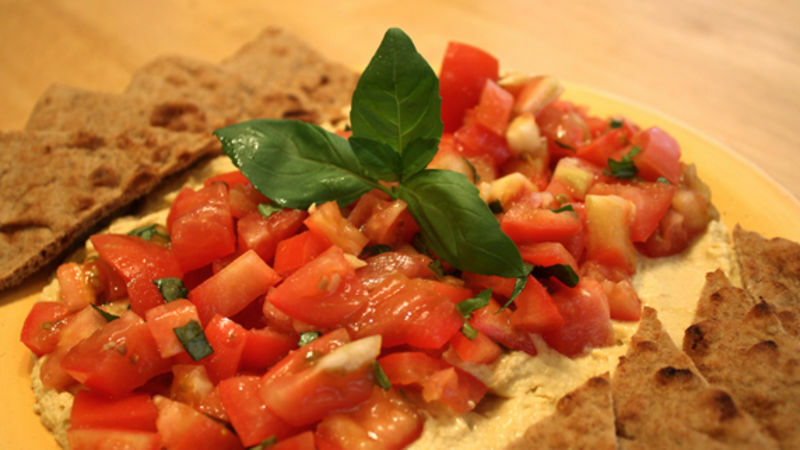 Serve with pita wedges, toast or crackers. Fusion foods are all the rage right now.It’s so fun to see how foodies are crossing cultural lines to make beautiful and delicious things (don’t we wish it were that easy for people to get along?!). One of my favorite Middle Eastern foods is traditional hummus. It’s packed with protein and I love that you can add all sorts of ingredients to give it different flavors. Well, I decided that it was time for hummus to have a little tête-à-tête with Italian cuisine -- say hello to Tuscan Hummus! This is also a great dish for parties—we served it as an appetizer at a recent dinner party and the crowd devoured it! Best of all, you can whip it up ahead of time and add the tomato topping just before serving.